Position the device or tray where you want it, then easily program, operate, and remove your Mount'n Mover. Use the Anatomy diagram and the Quick Guide to get the most of your Mount'n Mover. For more detailed demonstrations, refer to our How-to Videos. The Mount’n Mover can be customized to lock in specific, repeatable positions, but it is easily unlocked and moved. The mount and device remain in their locked positions until you use the hoop and paddle. The hoop releases the shoulder and elbow joints, allowing simultaneous movement of the two arm segments. As long as the hoop is depressed, the arm will bypass locked positions. When downward pressure is released, it seeks a new lock position. The Paddle unlocks the wrist joint, allowing rotation of the device. Depress, then release the Paddle. The wrist remains unlocked until you rotate it. As you move the device, it will begin to seek another lock position. The temporary unlock feature allows one-handed repositioning of the device. Change the device tilt angle for different situations—reduce glare, watch TV, see where you’re driving. The tilt hinge is a “torque hinge”. This means that it holds its position until a certain force is applied. The hinge comes in two different torque settings—High and Low. For larger devices, the High torque hinge is preferred. Lock setters provide repeatable, user-specific positions. 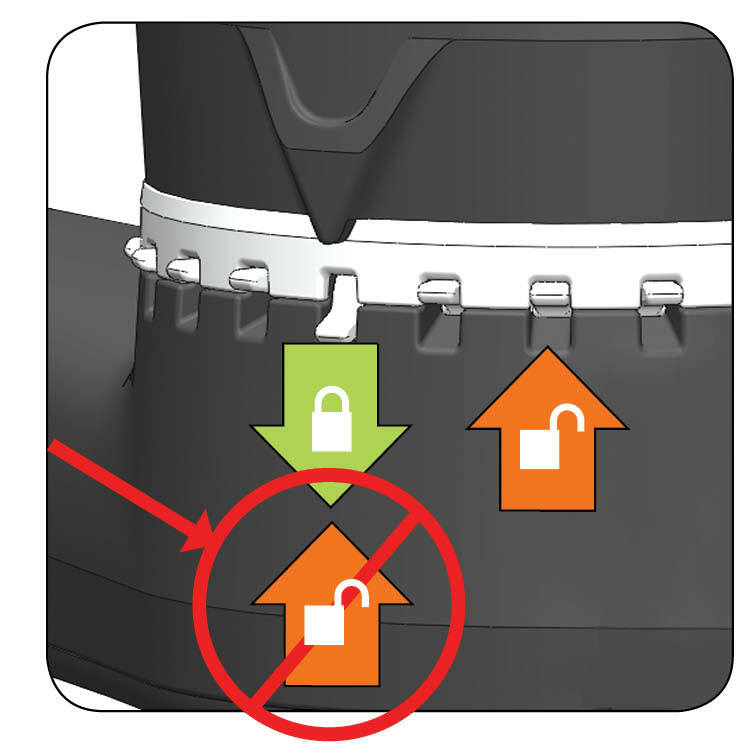 Lock position: When the black arrow is above a lock setter that is down, it will lock. Bypass position: Lock setter is up. To create a bypass location, flip a lock setter up. NOTE: You cannot unset a position when the black arrow is above it! Lock position: When the friction adjustment screw is above a lock setter that is down, it will lock. NOTE: You cannot unset a position when the friction adjustment screw is above it! Tool required: Use a coin or small flathead screwdriver. 2. Slide Link Cube on to post. Line up slot on post with front of cube. 3. Close Link Lever to secure cube to post. If cube moves on the post, tighten bolts 1/4 turn. For a more permanent mount to the post, tighten the 4 bolts to snug. Be sure the Link Lever is closed when tightening. The Quick Release Plate is attached to your device or tray. This makes attaching or swapping devices a snap at home or on the go! Begin by resting the arches of the QRP on the lowest protruding nubs along the edge of the tilt-plate. Rock the QRP back onto the tilt-plate. Close the rectangular handle until flush with the back of the tilt-plate. Finish by rotating the red safety lock counterclockwise for optimal stability. Secure the post by closing the cam lever. If it needs to be tighter, turn the bolt and lever clockwise and try again.